The Old Crown Inn i London, England : Boka nu! For large group I will ask for credit card deposit ! £30 per person per night sharing in family, triples and twin room. 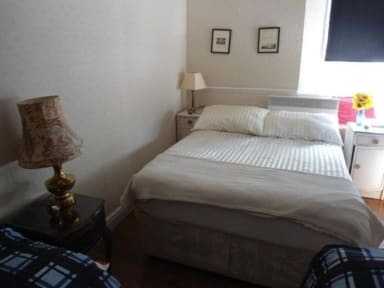 The Old Crown Inn rooms are very simple and en suite. The family room with en suit has 4 beds. The restaurant serve English breakfast all day long, with most fantastic burgers and the Traditional English roast every Sunday. Open mic is every Saturday and Sunday where people can join by playing the piano, congos, guitars and tambourines too. Free wifi is available. Carpark is £10 per day. We are opposite St Joseph Church and Lauderdale House in Waterloo Park, corner with Hornsey Lane , Highgate High Street and Dartmouth Park Road. The nearest tube station is Archway on the Northern Line, about 8-10 minutes down the road. The Old Crown Inn offers simply decorated yet very comfortable rooms. Also on offer; Board games, Fireplaces, Free View TV, Secretarial services, Restaurant & Tea Room, Kitchen & bar open till 1am, Pool room, Live music Licence, Beer Garden. Payment upon arrival by cash, credit cards.